We are going on vacation with Cuban Black Beans and Rice! 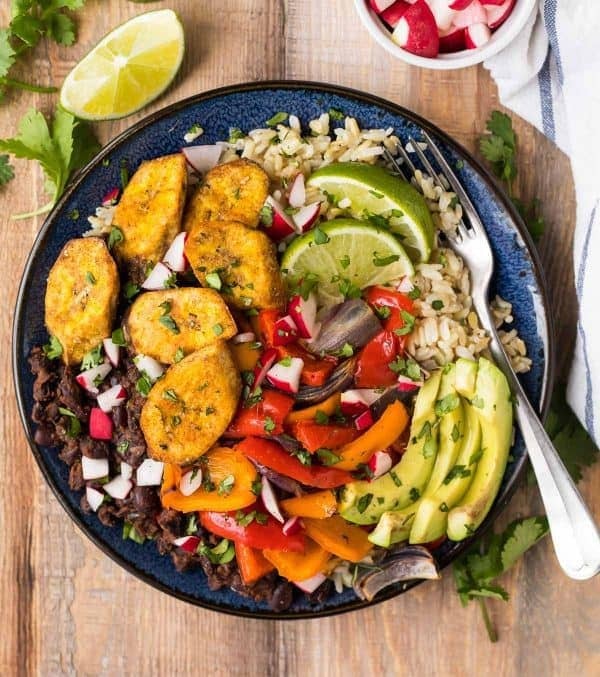 A mix of Cuban-style black beans, rice, roasted vegetables, and crispy baked plantains, this nourishing, richly flavored rice and beans turned nourishing, all-in-one meal is my way of bringing you a dreamy, sun-soaked beach vacation, wherever you may be. In my case, the “wherever” is Wisconsin, a few thousand miles north of the Florida escape Ben and I originally were slated to take this weekend. Unfortunately, he had to have an unplanned foot surgery, and since neither of us could picture him crutching down the beach, we decided to save our trip for a later date. I originally booked our tickets at 11:45 p.m. from the comfort of my bed. It had started snowing for the umpteenth time, I logged on, and in a moment I can only describe as GET ME OUT OF HERE, we wound up with two discount plane tickets to Miami. My brilliant late-night idea: we’d get a much-needed escape from the (still) cold Wisconsin weather and soak up some Vitamin D, all while eating copious amounts of Cuban food. At any hour, it was the perfect plan! Since missing vacation is a bummer, I decided to bring my personal favorite part of vacation home to us: THE FOOD! 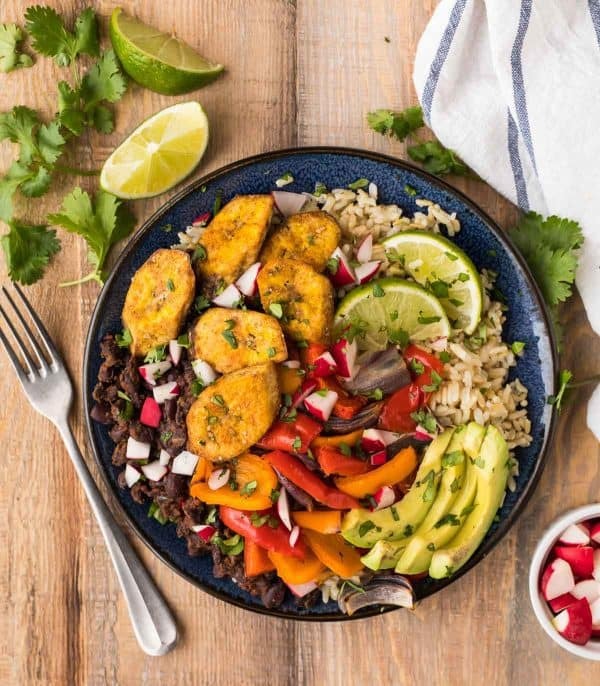 I took a classic recipe, Cuban Black Beans and Rice, and turned it into a meal “bowl” by piling it high with roasted vegetables, crispy baked plantains to mimic the Caribbean classic tostones, and then added an avocado to make it a complete meal. I may have to wait until visiting Miami to try true authentic Cuban black beans and rice, but for now, this recipe is my way of making up for one of the parts of the trip we were looking forward to most: a food tour of Little Havana, a Miami neighborhood with strong Cuban and Central and South American roots. While this recipe is probably not something you’d find on an authentic Cuban restaurant menu (if I do when we finally take our trip, I’ll let you know), the spices and ingredients are true to traditional Cuban cuisine. Also, this all-in-one adaptation of Cuban Black Beans and Rice is healthy and DELICIOUS. I love all of the different textures and spices. This meal is truly a win in the feels great/tastes great department. As much as I adore black beans and Cuban rice (especially since these Instant Pot Black Beans came into my life), I wanted to transform rice and beans into an all-in-one meal. After debating what to serve with Cuban Black Beans and Rice, I settled on roasted red peppers and onions, which tasted fabulous with the spiced beans. For even more texture, I added baked plantains. If you’ve never had a plantain, it’s that thing that looks like a giant banana that’s usually found in the grocery store next to the normal bananas. The two, while similar in appearance, taste completely different. Plantains are starchy (in a good way) and range from green (unripe) to black (very ripe). Using green plantains is traditional and will give you a bewitchingly addictive “chip” effect. 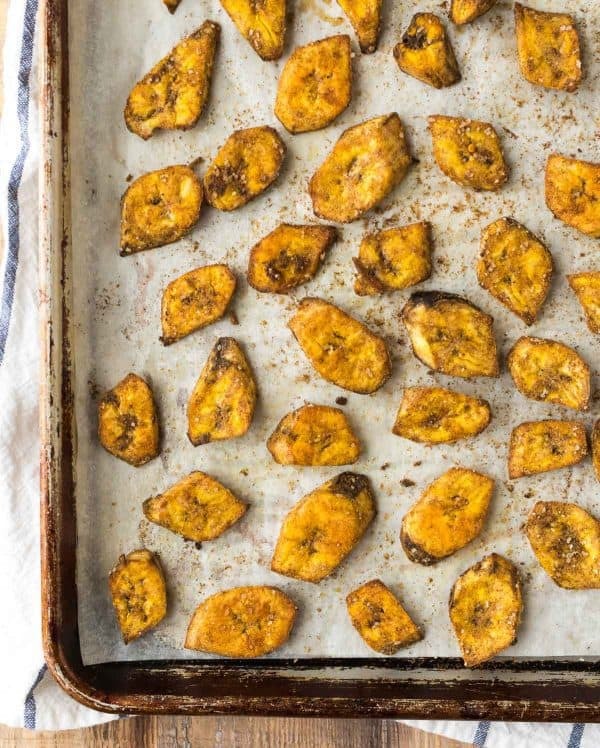 I equally adore roasted ripe plantains, which are much sweeter. This Cuban Black Beans and Rice recipe calls for the plantains to be ripe, but if you only have green plantains, they’re delicious served on the side. If you’ve never peeled a plantain before, I recommend checking out the Pioneer Woman’s tips for how to peel plantains. Buy the biggest, fattest plantains you can find and be patient. It took me a few tries to get the hang of it. While I can attest that the Instant Pot Black Beans linked in the recipe below are wonderful, if you are in a hurry (or don’t own an Instant Pot or similar electric pressure cooker), I also have notes to make the Cuban Black Beans and Rice using canned beans. It will still be plenty flavorful and satisfying! For those with dietary concerns, Cuban Black Beans and Rice are vegan, gluten free, and nut free too, so all can enjoy. I can totally see them happening for a fun, unique dinner party. “Build Your Own Cuban Beans and Rice Bowls.” I’d dive in! I finished my beans and rice off with lots of colorful chopped radishes, cilantro, and a squeeze of lime. These Cuban Beans and Rice work well for meal prep also. The next day for lunch, I stirred the leftover veggies, rice, and black beans together in a bowl, popped it into the microwave, and then topped it with avocado. Delish and a total upgrade to my midday routine! From Wisconsin with love, a little piece of vacation. 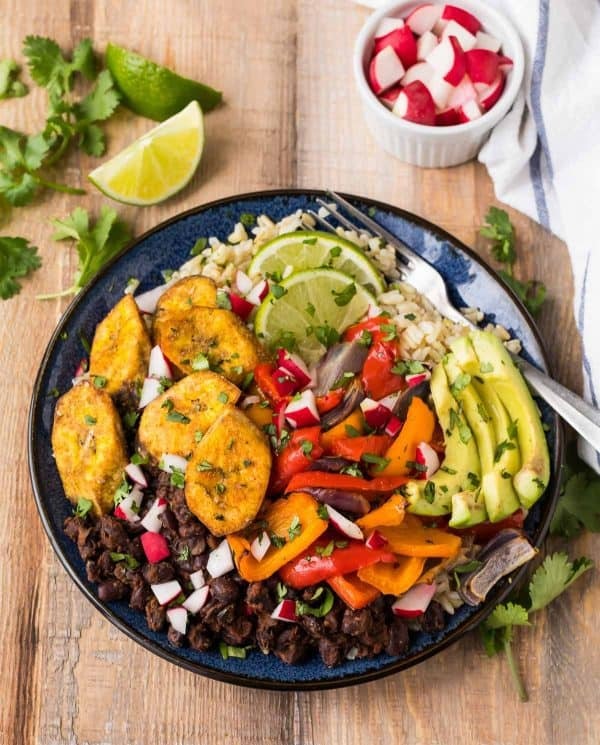 A fresh twist on authentic Cuban Black Beans and Rice with baked plantains (tostones), roasted vegetables, and avocado. A healthy, filling all-in-one meal that’s vegan and gluten free! While the rice cooks, place racks in the upper and lower thirds of the oven and preheat the oven to 400 degrees F. Line two rimmed baking sheets with parchment paper. 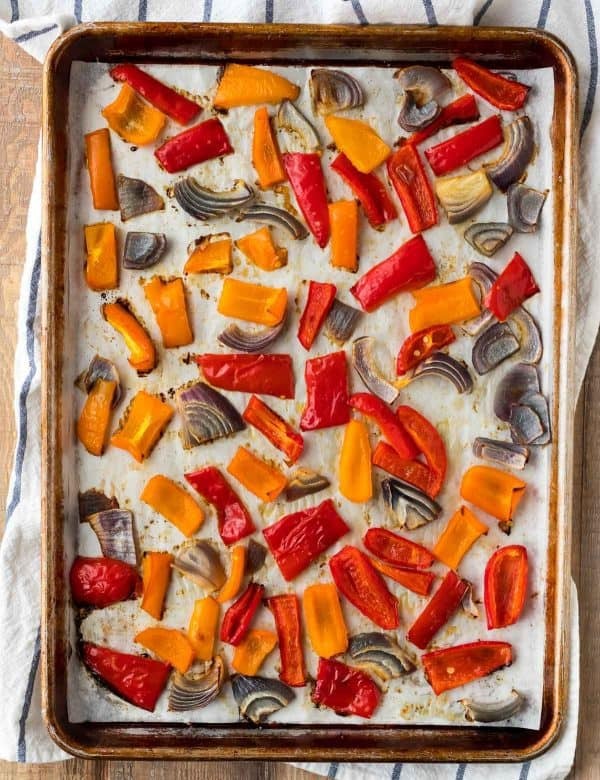 Place the plantain slices in the center of one baking sheet and the bell peppers and red onion in the center of the other. Drizzle each baking sheet with 1 tablespoon olive oil and sprinkle each with 1/2 teaspoon salt. Sprinkle 1 teaspoon cumin and 1/4 teaspoon allspice over the plantains. Toss the plantains and vegetables to coat, then spread each into an even layer. Bake in the upper and lower thirds of the oven until the plantains are lightly browned and very tender and the vegetables are caramelized and tender, about 16 to 18 minutes for the plantains and 20 minutes for the vegetables, switching the pans’ position on the upper and lower racks once halfway through. While the rice, plantains, and vegetables cook, heat the remaining 1/2 tablespoon olive oil in a saucepan over medium heat. Add the jalapeño and cook, stirring often, until tender, about 2 minutes. Stir in the tomato paste, garlic, oregano, and remaining 1/2 teaspoon salt, 2 teaspoons cumin, and 1/4 teaspoon allspice. Cook just until fragrant, about 30 seconds, then stir in the black beans and 1/4 cup water. Cook until the liquid is slightly reduced and the beans are hot, about 2 to 3 minutes. Taste and adjust seasonings as desired. Divide the cooked rice evenly among 4 bowls. 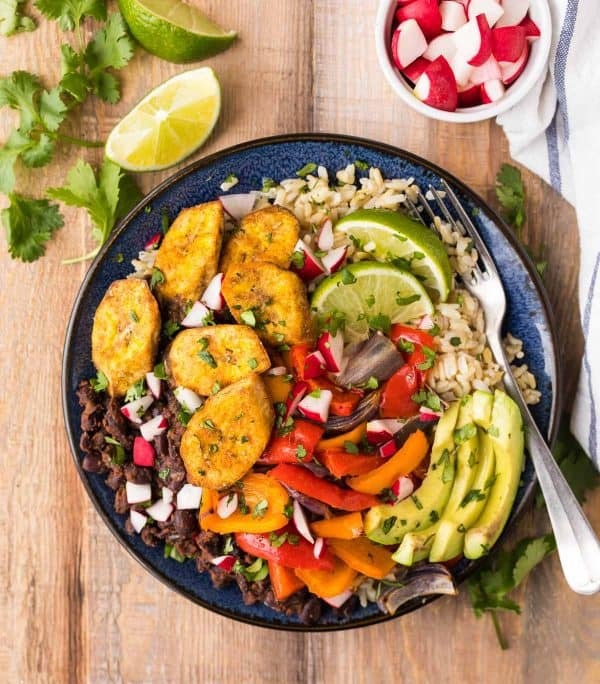 Top each with beans, roasted plantains and vegetables, a big handful each of sliced radishes, avocado, cilantro, and a squeeze of fresh lime. Store leftovers in the refrigerator for up to 3 days. Reheat gently in the microwave. The beans and rice can be frozen for up to 3 months. To best enjoy frozen leftovers, I recommend letting the beans and rice thaw overnight in the refrigerator and making a fresh batch of roasted vegetables and plantains. PLANTAIN TIPS: I liked this recipe best with ripe plantains, but if yours are still green or even yellow/green, you can still make this recipe. Just know they will be more hard and crisp like a potato chip versus more tender and sweet. If you've never peeled a plantain, despite similar appearances, they do not peel like a banana. Be sure to check out this guide to save yourself a lot of aggravation! hey girl- that’s a bummer y’all can’t go to Miami. At least you can have this food- it looks so yummy! One of the best blog recipes I’ve ever tried! It was so filling and the flavors were unexpected and delicious. Looking forward to leftovers tomorrow! Georgia, I am so so glad you went for it and gave it a try!! Thanks for taking time to leave this lovely review. I can’t wait to try it! We live in Northern Illinois, so I feel your winter pain! I hope you get to go to Miami soon. I was lucky to get away to Havana, Cuba on a cruise last week, and was searching for recipes to help me relive my vacation. Thank you! Lucia, I hope you love the recipe. And YES a warm escape is a part of winter survival!